This Monday, our nation remembers a true colossus of American history. The Reverend Dr. Martin Luther King Jr., perhaps more than any other man in modern times, united the country against the injustices of racial segregation, and enthused every future generation with his message of peace, tolerance, and equality. His fight is as relevant today as it has ever been, and his words resonate with the same power as when they were first heard half a century ago. With a matchless and unbreakable resolve, he led the fight for the powerless and the forgotten, for the people whose voices couldn’t, or wouldn’t, be heard—and paid, ultimately, with his life. Before we get to his Rolex Datejust ref. 1601, let’s examine why this man has left a legacy. Born in Atlanta, Georgia on the 15th January 1929, King was already known for his great eloquence by the time he attended high school, forming part of the debate club and winning contests for public speaking. Following in his father’s footsteps, he entered the seminary, graduating in 1951 with a B. Div degree, and went on to gain a Ph.D. in systematic theology from Boston University in 1955. On December 1st of that year, Rosa Parks was arrested in Montgomery, Alabama, for refusing to give up her bus seat to a white passenger, leading to a city – and eventually, state-wide boycott of the public transit system by African-Americans. The protest, instigated by fellow campaigner E. D. Nixon, was directed by King and lasted for 385 days, eventually ending segregation on all Montgomery buses, and transforming King into a national figure and leading voice in the civil rights movement. Adopting the principles of non-violent resistance espoused by Mohandas K. Gandhi in his own fight against British rule in India, Dr. King defined his goals as being not to defeat his opponents, but rather to bring about reconciliation, and advocated for his followers to accept suffering without retaliation. It was a philosophy based on hope, endurance, and a belief that justice will always triumph. In 1963, Dr. Martin Luther King Jr. delivered a speech that underlined his status as one of the finest orators of all time. On August 28, the ‘March on Washington for Jobs and Freedom’ brought a crowd of 250,000 to the nation’s capital, gathering in front of the Lincoln Memorial to hear leaders from the Southern Christian Leadership Conference speak. Agreeing to appear last, Dr. King departed from his prepared notes and issued a 16-minute address, which has since passed into the history books. Carried by the strength of his charisma and the force of his convictions, the “I Have a Dream” speech became a beacon of the civil rights movement, with a message of optimism and courage for a future defined by equality for people of all races and religions. 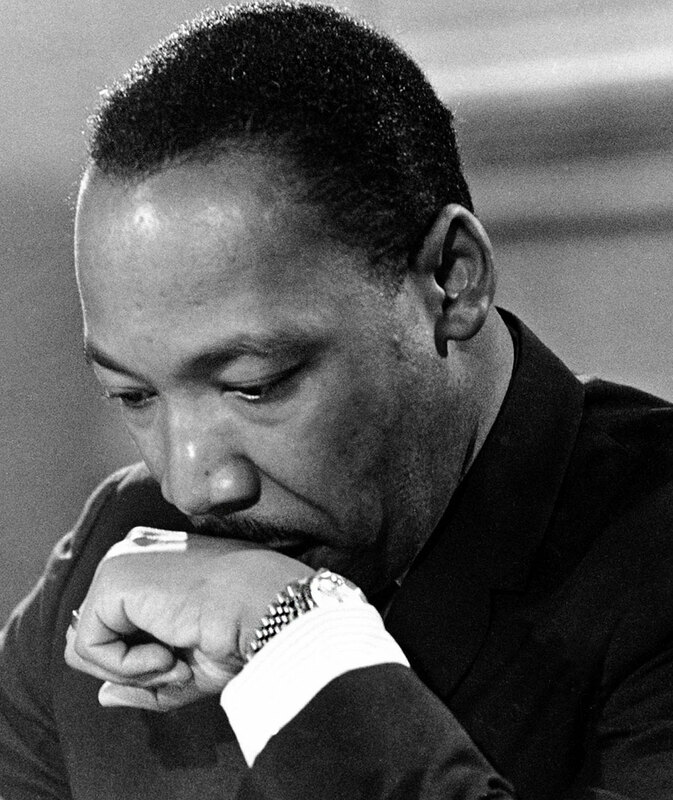 Dr. Martin Luther King Jr. wore a Datejust ref. 1601 in 14k yellow gold. 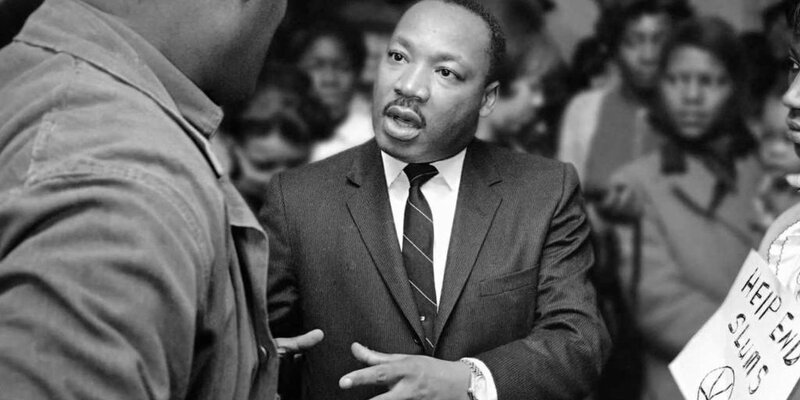 Throughout his life, Dr. Martin Luther King Jr. wore a Rolex Datejust ref. 1601. 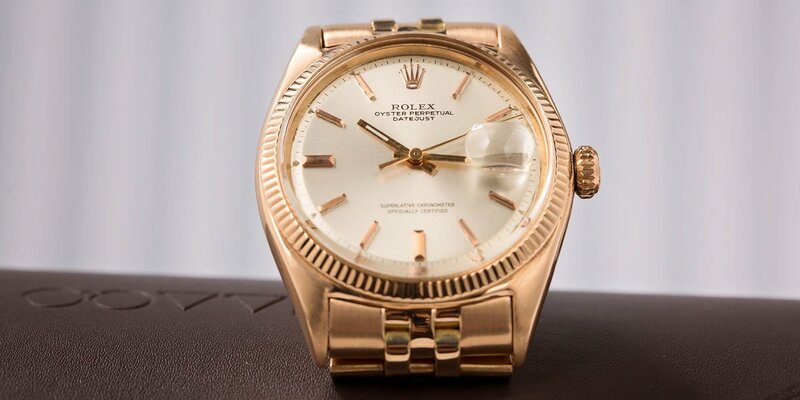 His yellow gold example – with its champagne dial and fluted bezel on a Jubilee bracelet – was a fitting choice; a watch made for leaders of men, or entire movements. 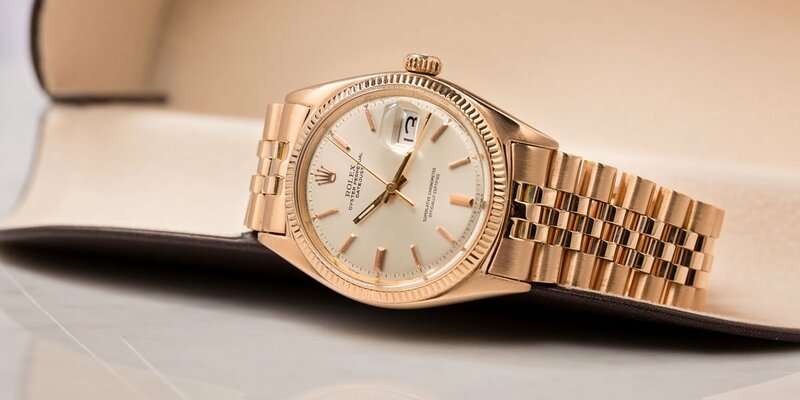 It is a model that has found itself on the wrist of many great and influential people over its lifetime, including President Eisenhower and British Prime Minister, Winston Churchill. 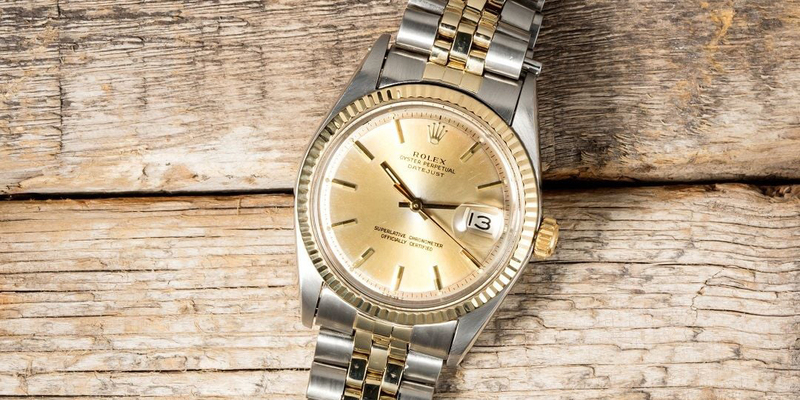 Dr. King wore his Rolex Datejust ref. 1601 on a Jubilee bracelet. 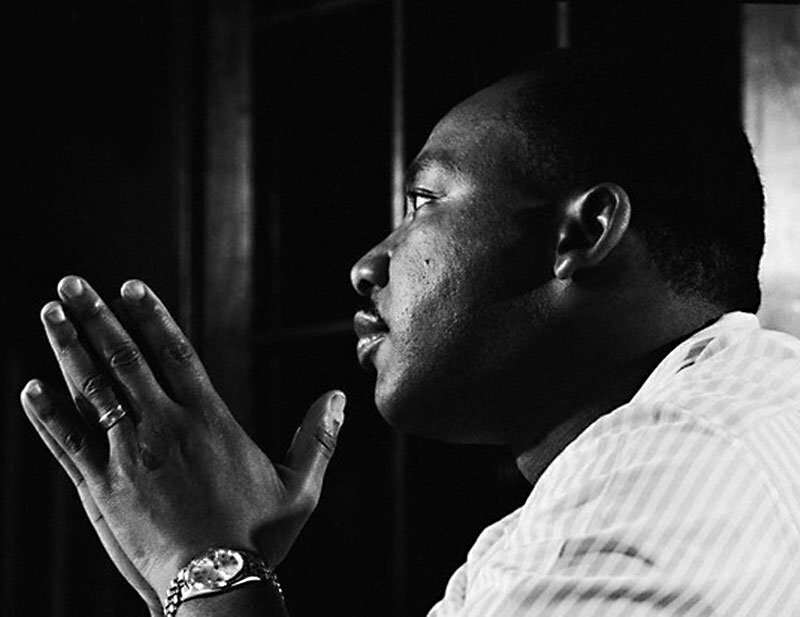 However, Rolex themselves describes Dr. Martin Luther King Jr. as one of the greatest heroes in their history, featuring him in a 2013 ad campaign alongside luminaries from the world of art, cinema, and sports. The Swiss watchmakers are no strangers to the fight against oppression. During the Second World War, they were unwavering in their support for the Allied forces battling Hitler’s fascist armies; a bold move considering their supposedly neutral country was surrounded on every border by Nazi or Nazi-occupied lands. Their integrity found a match in Dr. King and their admiration for him is obvious – a hero in the truest sense of the word with a morality born of unwavering beliefs. He was honored with the Nobel Peace Prize in 1964, the youngest ever recipient at age 35; however his life was tragically cut short just four years later by an assassin’s bullet in Memphis. His continuing influence is still being felt today, his stature as a true American patriot acknowledged with the posthumous awarding of both the Presidential Medal of Freedom and the Congressional Gold Medal.